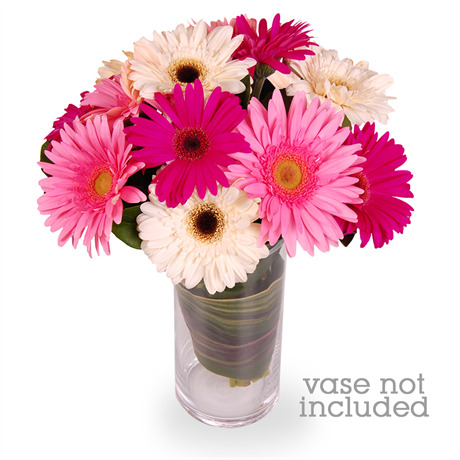 A lively swirl of pink, the Zoe is a fun and energetic bunch of 12 gerberas that evokes only the brightest of smiles. The chromatic tones of raspberry pink, candy pink and creamy white are reminiscent of fields of wildflowers, and are fantastic as a ‘get well’ gift. Hand-tied in paper and ribbon and delivered directly to the door of your lucky recipient, the Zoe is a refreshing and vibrant bouquet designed to elicit appreciation. Surprise a special girl and astound her with your spontaneity and generosity. This gift is especially apt for lovers of the colour pink. This vivacious selection of field fresh flora does not come with a vase, however we recommend selecting a regular vase from our gift section. This stylish glass container is convenient, practical and can be kept as a keepsake.